This Black History Month, Wounded Warrior Project salutes hidden figures in the United States military. This installment honors the Navy’s first black female rear admiral, Lillian Fishburne. In 1998, Cohen delivered this quote during a ceremony honoring Rear Adm. Lillian Fishburne, a military pioneer. Fishburne, the first black woman to rise to a flag rank in the United States Navy, "is a woman whose story helps us to understand the truth that women are an indispensable part of today's military," Cohen said. Fishburne’s legacy seemed sealed by being born into naval family at Patuxent River in Maryland. According to her father, an active duty Navy man, his daughter’s career vision and military ambitions were never doubted because of her gender. His love and unwavering faith were confirmed when Fishburne graduated from Lincoln University in Oxford, Pennsylvania, in 1971. Not even two years had passed before Fishburne completed Women Officers School training at Newport, Rhode Island. In 1973, she received an ensign commission. Fishburne wasted no time establishing momentum in the Navy. Her first role was personnel and legal officer at the Lakehurst, New Jersey, Naval Air Test Facility. Early evidence of a talent for leadership and an unwillingness to rest on her laurels ensured her swift climb in the naval ranks. After a recruiting tour in Miami, Florida, and charge of the Naval Telecommunications Center in Great Lakes, Illinois, early in her career, she attended the Naval Postgraduate School. Following school, she stepped into the role of assistant head, Joint Allied Command and Control Matters Branch. Fishburne’s leadership skills took her all the way to Japan as executive officer at the Naval Communications Command, but the United States has benefitted most from her gifts and work ethic. There had only been 18 black rear admirals in the Navy before Fishburne. She became the 19th and the rank’s first black woman on Feb. 1, 1998 when President Bill Clinton promoted her. Her promotion came on the heels of helming the Pentagon’s Command and Control Systems Support Division and commanding the Naval Computer and Telecommunications Area Master Station, Eastern Pacific, in Hawaii. For those who do not hesitate to trade their lives for our freedom, there is no such thing as overuse of the term “highly decorated.” Rear Adm. Lillian Fishburne embodies it. 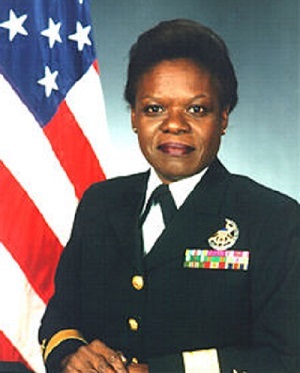 Her list of awards includes two Navy Commendation Medals, a Navy Achievement Medal, a Meritorious Service Medal, and a Defense Superior Service Medal. She retired in 2001 after her tenure in Washington, D.C., as director of the Information Transfer Division. Fishburne has a daughter, Cherese, with her husband, Albert J. Sullivan. Rear Adm. Lillian Fishburne stands with countless other hidden figures in our armed forces who could not have known what their strides would mean for the American military and for generations of girls and women after them. Perseverance often comes at a price. Hidden figures pay the toll for us all with their sacrifice, tenacity, and unwavering hope for the future.